We could not have written a better “About” page than Philadelphia Mayor Michael Nutter wrote for us in presenting a minority entrepreneur citation in the Green Business category to Greendog Recycling and our President, Andy Truong. Below is an excerpt from the citation. Andy Truong and his management team are South Vietnamese war refugees who arrived in the U.S. as children in the mid-1980′s. Settling in North Philadelphia, Andy graduated from Olney High School and then opened a branch of Thy Hong Music in South Philadelphia. He recognized a need for a quality ferrous and non-ferrous metal recycling center that focused on the everyday metal recycler. He sold his Vietnamese music business and along with several family members, he founded Greendog Recycling with the mission to provide recyclers such as himself with a safe and fair place to recycle scrap metal. Andy Truong is a hands-on operator taking responsibility as the primary excavator and managing sixteen full-time employees. Since opening, Greendog has kept millions of pounds of recyclable scrap metal out of landfills and continues to grow as a family-owned enterprise that focuses on corporate social responsibility. He is active in the Crutches 4 Africa charity that works to distribute mobility devices to refugee camps in Africa and points across the world. It is fitting and appropriate, therefore, that the City of Philadelphia officially recognize An “Andy” H. Truong, President of Greendog Recycling, Inc. for providing such an outstanding role model to minority entrepreneurs and a successful model business and asset to the minority-owned business network of Philadelphia. 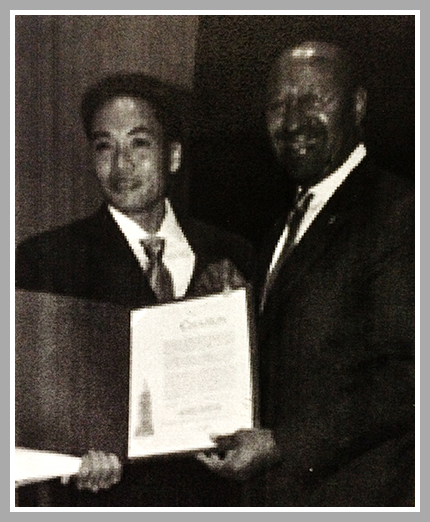 The citation was presented at the 2011 National Minority Enterprise Development Week awards reception. Greendog Recycling was honored in the Green Business category. Greendog Recycling President Andy Truong accepts a minority entrepreneur award citation from Mayor Michael Nutter.